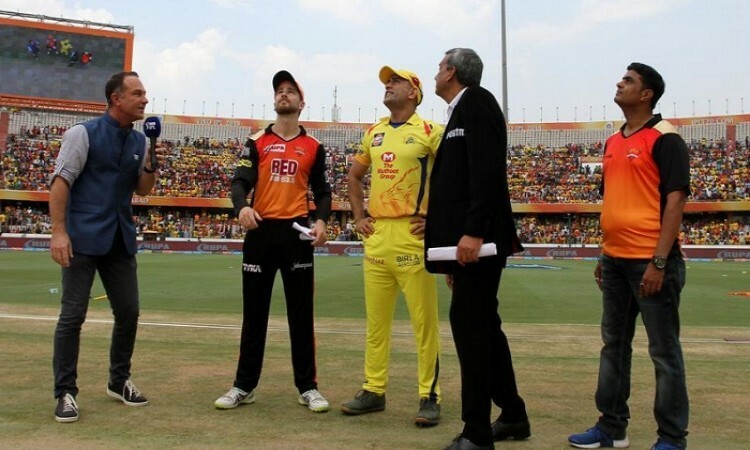 Hyderabad, April 22 (CRICKETNMORE) - Sunrisers Hyderabad captain Kane Williamson won the toss and opted to field against Chennai Super Kings in an Indian Premier League (IPL) clash here on Sunday. Williamson was forced to replace injured opening batsman Shikhar Dhawan, who makes way for Ricky Bhui, while pacer Billy Stanlake is back in the side for Chris Jordan. Chennai's South African veteran leg-spinner Imran Tahir is not well and has been replaced by his compatriot batsman Faf du Plessis. Chennai Super Kings: Shane Watson, Ambati Rayudu, Suresh Raina, Faf du Plessis, Mahendra Singh Dhoni (captain/wk), Sam Billings, Dwayne Bravo, R Jadeja, Karn Sharma, Deepak Chahar, Shardul Thakur.